Unappetising foreign objects in food: how they get there and what your rights and responsibilities are if it happens to you, is today’s Consumerwatch topic. But first, I can’t possibly fail to mention Carte Blanche’s great big honey revelation of Sunday - especially as the honey adulteration was found to be happening right here in KZN. Listen to this week's Consumerwatch below, or read the details under the podcast. Tests conducted overseas, on behalf of the SA Bee Industry Organisation, found that the honey produced by Grandis Apiaries of Howick contained a serious whack of sugar. Owner Roland Kennard admitted to feeding sugar to his bees - as opposed to letting them feed on pollen - but denied cooking up sugar and lemon juice to simulate honey, as claimed by a whistleblower. His product is sold under the labels Struckmeyer’s, Honey Bee, Asal, and another product described only as Natural Honey. So if you’ve bought any of those brands, you should take the bottle back to the store you bought it from for a refund. And so to those Unappetising Foreign Objects in food, or UFOs… everything from a worm in chocolate and weevils in a bag of flour to the more shock-inducing things. I’ve been sent photos of a bolt baked into a six-pack of hot cross buns, a gheko in a bag of baked muesli, and probably most bizarrely, a name tag - Jo - baked into a large steak pie. Every month I get at least one UFO email. This week’s one came from a chap who found what he insists was a piece of a condom in a tub of ice-cream, but the company is insisting that it was just some undissolved gelatine. They established this by putting it under boiling water, so that evidence is now gone. Read: Theft by radio waves? Last month, Samuel emailed me to say that while he was drinking a beer, he noticed an electrical wire at the bottom of the bottle. "I then put the cap back on and contacted the brewery,” he said. A company rep visited him, and he refused to hand over the bottle. He was later told that no evidence of contamination was found and he was offered a R300 voucher which he refused because he thought it was not enough. So I asked him what amount he thought was fair. R20,000, he said. Here’s the thing - South African companies only compensate for actual harm caused by their products - not for coming across a UFO in your food. Not wanting to give up the evidence, as in Samuel’s case, is a common, understandable reaction, when you consider what happened to that alleged piece of condom in the ice-cream. So first take a lot of good photos of the UFO, keep a bit of the UFO, and then hand over the rest of it, and the product it came in, to the company. Here’s what you’re entitled to: the company owes you replacement product - not a big fat hamper - or a refund of what you paid, plus an explanation of how the object made its way into the product and what they are doing to ensure that it doesn’t happen again, if it was their fault. If a UFO causes you some kind of physical harm or makes you sick, you’re entitled to a refund of your medical expenses, but you’ll be required to produce a doctor’s note to back up your claim and receipts for consultations and medication. The things which disgruntled workers deliberately add to the food - condoms, for example - as an act of sabotage. And then there are the UFOs which consumers themselves add to food products they’ve bought and then try to extract money from the company. A study by Glass Technology Services in the UK five years ago found that 70% of the glass fragments reported by consumers as UFOs and submitted for analysis originated from items that are commonly found in the home. Nestlé SA told me the company goes to extraordinary lengths to investigate UFO complaints. When someone complained that they’d found sand in their baby formula, Nestlé had the sand tested by a lab, which found that it came from the Western Cape, not Harrismith, where their formula is produced. A cautionary tale for someone considering planting a UFO. And if you’re going to take to social media to rant about your UFO discovery, do be very sure of your facts. A couple of months ago, a woman, who’d asked a Kauai staff member at a Cape Town branch to remake a smoothie because the first one was too runny, saw some slimy stuff at the bottom of that second smoothie and was convinced it was saliva - as in that smoothie maker had punished her for rejecting her first smoothie. It turns out the slimy stuff was banana which hadn’t been fully blended. Kuaui got a High Court interdict to force that woman to remove her post and all the comments on it - some of them vile. And she’s really lucky she wasn’t made to pay their legal costs. So be very wary of making such premature claims on a public platform. If it’s not true and in the public interest, you are laying yourself open to legal action. 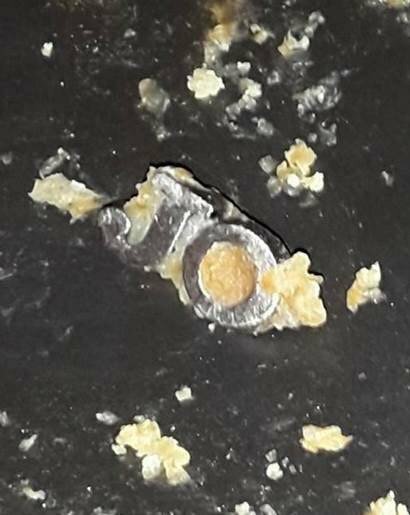 The name badge which a Durban man found in a steak pie. 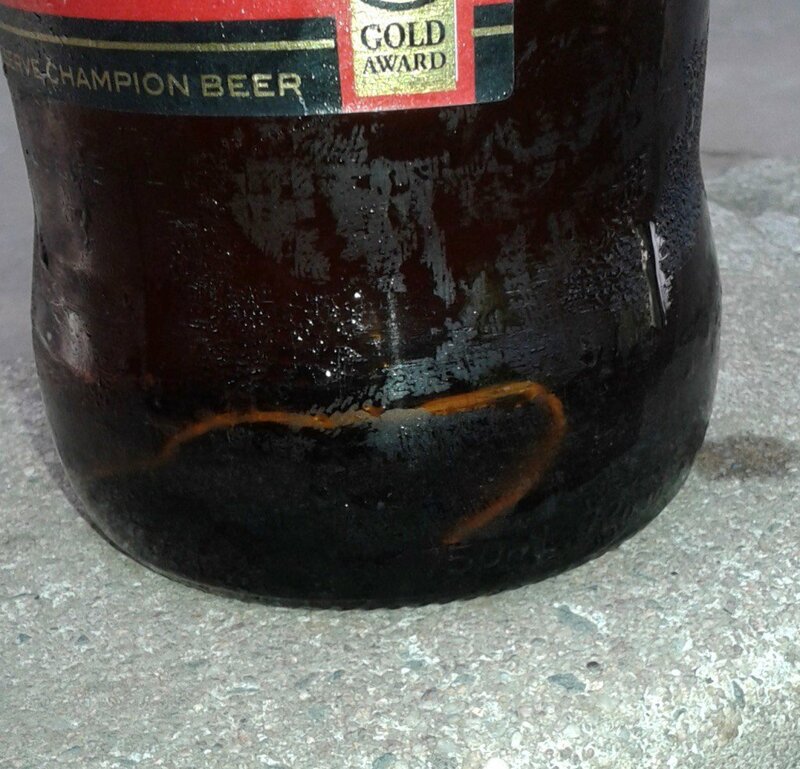 The wire in Samuel’s beer - he thought the company should pay him R20,000 as compensation for spotting it while drinking the beer. Have you ever found a UFO in your food item? Let us know below.